Welcome to There’s Just One Mommy shop page. Here you will find the books I’ve authored and co-authored, as well as some of my favorite products. 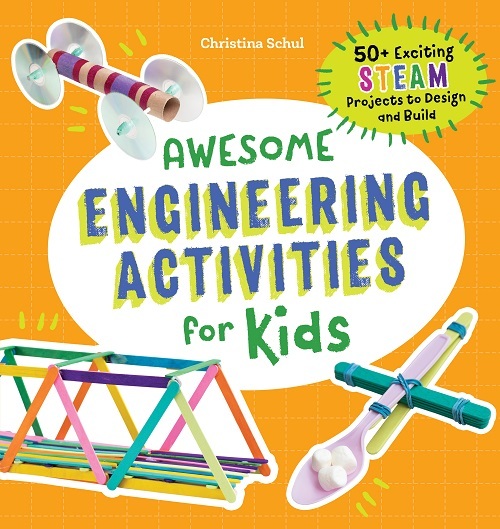 Make engineering for kids fun and inspiring with my latest book. From toothpick towers and marble runs to egg drops and water rockets, Awesome Engineering Activities for Kids is filled with over 50 exciting projects that will challenge and delight kids ages 5-12. Your child will learn how and why things work as they explore amazing projects all by themselves. They will also discover important STEAM connections. Each activity includes a short section that explains how engineering relies on science, technology, art, and math. Find Awesome Engineering Activities for Kids on Amazon. Learning should be fun! 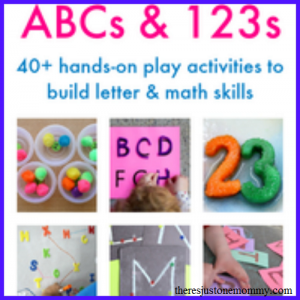 ABCs & 123s is an Ebook that provides over 40 fun hands-on learning activities that focus on letter and math skills. It is geared towards ages 2-8, and would be a great resource for parents as well as early educators. Click here to find out more about the Ebook, or purchase your copy by clicking below. Ebook ($14.99) Click here to purchase. Writing is such an important skill for children to learn. Not only is writing a part of our daily lives, writing can also be an important outlet to help process and express feelings that may be difficult to do by speaking. 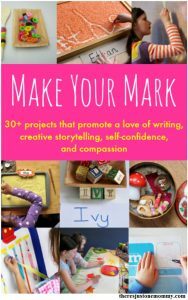 Now you can encourage your child’s love of writing with Make Your Mark. This Ebook includes over 30 projects perfect for the very earliest writers to reluctant writers. Click here to find out more about this awesome resource. You can purchase your copy below. Does your child like to create and build? Take that love to new heights with Up! 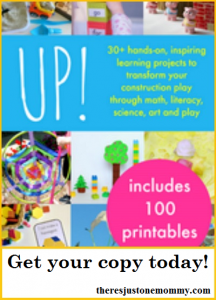 This ebook has over 30 hands-on learning projects to transform construction play through math, literacy, science, art and play. It is written for kids ages 4-10, and includes 100 printable pages. Click here to find out more about the book, or purchase your copy by clicking below. Why settle for just one great book? Buy ABC’s and 123’s and Up! and get Make Your Mark free! 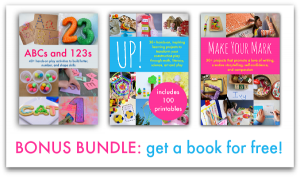 ebook bundle ($29.98) Click here to purchase. 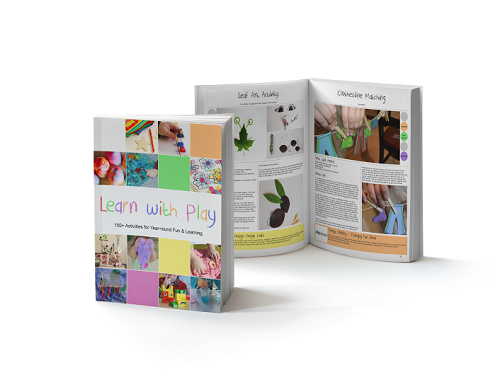 This book is packed with over 150 activities from bloggers all over the world. It is geared towards young children (infant-kindergarten) and includes a wide variety of ideas. It is a wonderful resource for parents, teachers, and caregivers. Click here to find out more about the book. The book is no longer available to order online. To get a copy of the Ebook, please email me at phaetalle(at)theresjustonemommy(dot)com. 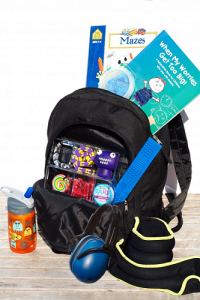 The following are some of the best products I’ve found when it comes to Sensory Processing. I am proud to be an affiliate with each of them. 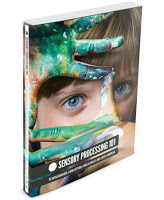 Sensory Processing 101 is actually 3 books in one, and it is one of the top resources for information on Sensory Processing. It explains each of the sensory systems and how they affect behavior and functional skills. Activities and printable resources are included. Get it today and never struggle to understand Sensory Processing (or how to explain it) ever again. Available in Ebook and Print Format. Shop here. Find your Sensory Fix here.